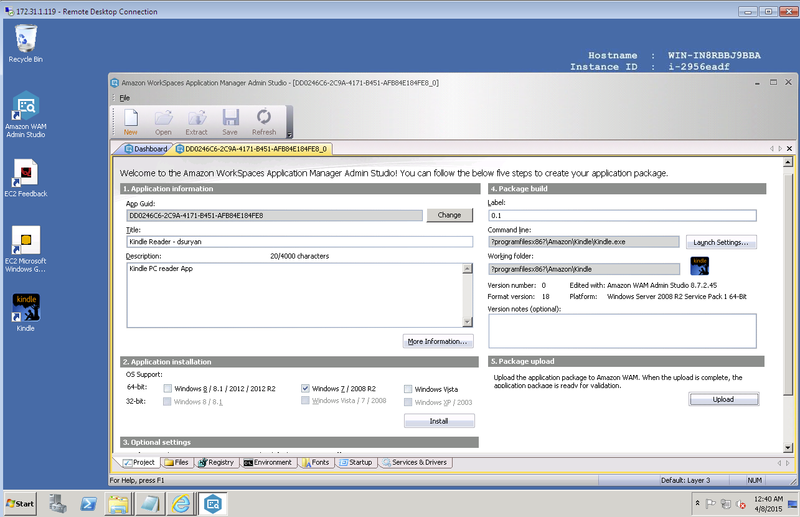 Amazon WorkSpaces Application Manager (Amazon WAM) offers a fast, flexible, and secure way for you to deploy and manage applications for Amazon WorkSpaces. Amazon WAM accelerates software deployment, upgrades, patching, and retirement by packaging Microsoft Windows desktop applications into virtualized application containers. 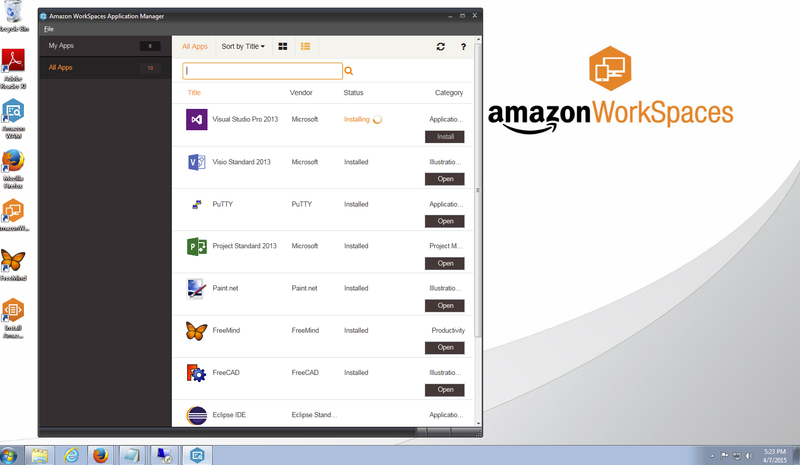 These applications run on the end-user’s Amazon WorkSpaces instance as though they are natively installed. Amazon WAM allows you to build and curate a selection of desktop applications for your users and control access to those applications. You can build an application catalog of third party applications that you already own the license for, internally-developed custom applications, and applications purchased through the AWS Marketplace for Desktop Apps. Simple, pay as you go, user-based pricing ensures that you only pay for the applications that people use. Receive twelve months of access to the AWS Free Tier and enjoy AWS Basic Support features including, 24x7x365 customer service, support forums, and more. Please note that Amazon WorkSpaces is not currently available on the AWS Free Tier. Provision desktop applications to WorkSpaces as virtualized app containers while maintaining centralized control, security, and compliance from an easy-to use management console. Amazon WAM handles all of the upgrades, patching, and retirement of your applications. Amazon WAM enables Microsoft Windows applications to be packaged and deployed to users in your organization. Build and manage your application catalog of third party applications that you already own the license for, internally-developed custom applications, and applications purchased through the AWS Marketplace for Desktop Apps. Track real-time usage of applications so you only pay for the applications that are used. Manage license usage by applications, versions, users, or groups. Reduce the burden on IT and increase user productivity by allowing users to select and install the applications they need, as they need them. Amazon WAM features simple, pay as you go, monthly, per-user pricing. Eliminate the need for up-front investments in software and hardware used to manage and deploy applications, and reduce operational expenses for managing applications. Amazon WAM Lite is available at no charge, and Amazon WAM Standard is priced on a monthly, per user, subscription basis. 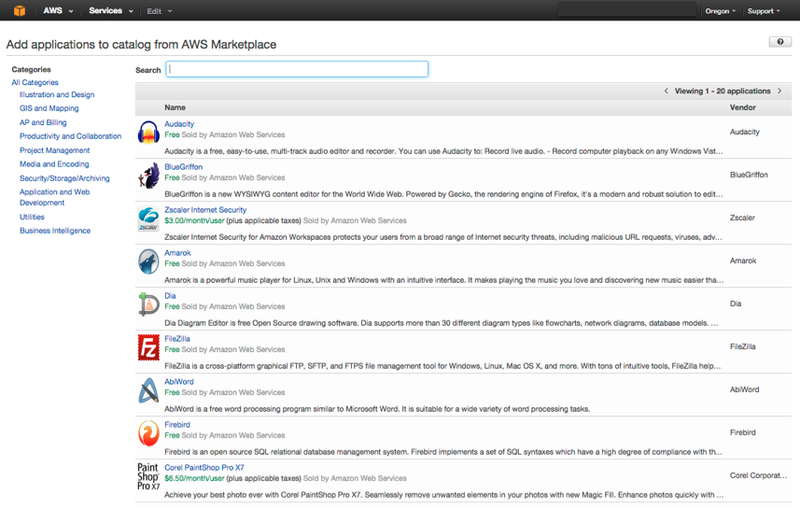 Applications purchased from the AWS Marketplace for Desktop Apps are priced individually, and prices are shown in the AWS Marketplace shopping and buying screens on the WorkSpaces console. Amazon WAM subscriptions are available in either Lite or Standard plans, pricing as follows. *All Amazon WAM Lite applications will be set to Optional. Amazon WAM includes up to 100GB of Amazon S3 storage for the applications that you upload to the service in each AWS region. You are charged Amazon S3 rates for storage that you use in excess of 100 GB. You can review the amount of storage used by your applications via the Amazon WAM console. Amazon WAM deploys applications to Amazon WorkSpaces, so end users also need to have a WorkSpace; for pricing information, see the Amazon WorkSpaces pricing page. There are two ways to add applications to your catalog and make them available for your users: upload applications or shop for applications from the AWS Marketplace for Desktop Apps. Regardless of the method, you can manage user access and monitor real-time usage of applications and user fulfillment. You can package and deliver your own line of business applications or applications where you already own a license in order to build an application catalog. Use Studio and Player to package Microsoft Windows desktop applications into virtualized application containers, validate them, and import them to your application catalog. 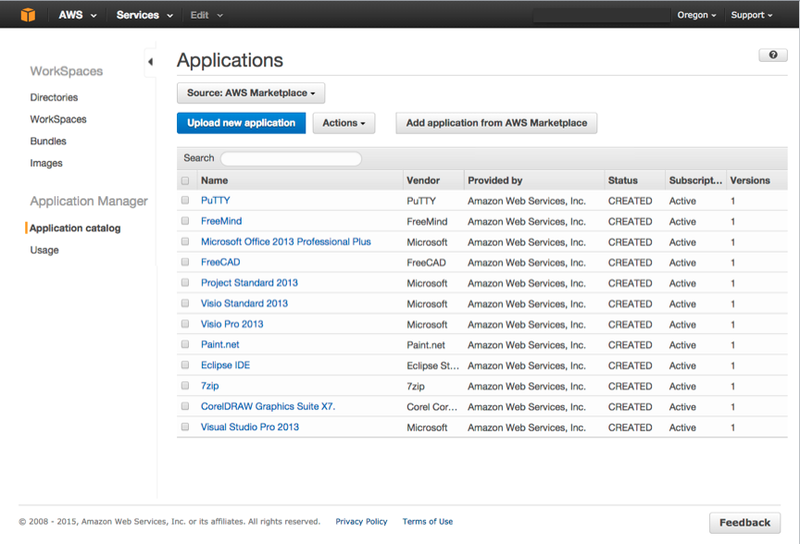 In addition to uploading applications, you can select applications from the AWS Marketplace for Desktop Apps. Applications are available in a variety of categories, including application development, illustration & design, and productivity. You can use packages shared with your AWS account to create an application in your catalog. You can apply customizations to the application you create using Configurable AppEvents set up by the owner of the package.